Nice job on the 262. I should add one of those to my stash, even though I usually don't build the losers. It would be the final addition to my yet to be completed Heinz Barr collection. The Defiant is looking good. 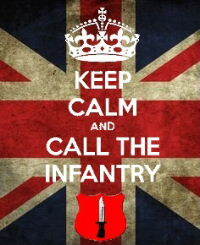 I should get started on mine ASAP (after september, april probably by then the gb will be over). You're killing it with that Omnibus. Very impressive build. 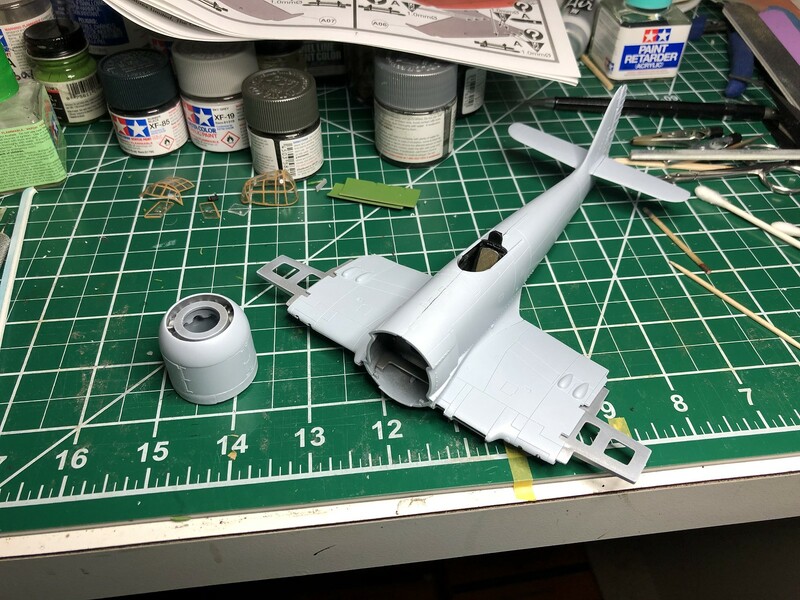 Could you add a 1/72 F-86D (MPC boxing) to my list? 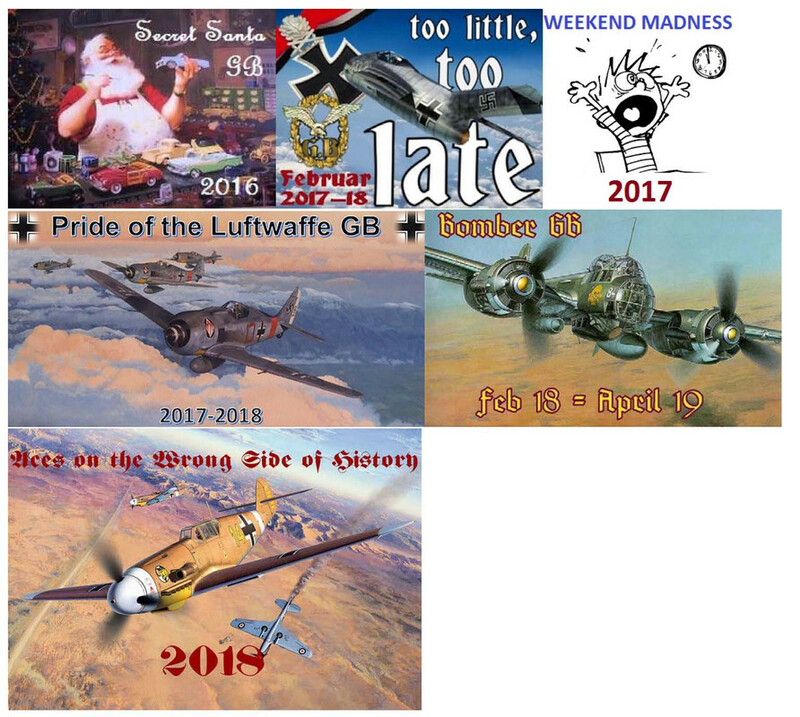 It snuck in whilst I was bringing in some wayward Tamiya P-51's from the outdoor storage closet. It's so cute I don't have the heart to put it back. I'm thinking Phillipine markings for this one. pat, its coming on nicely. 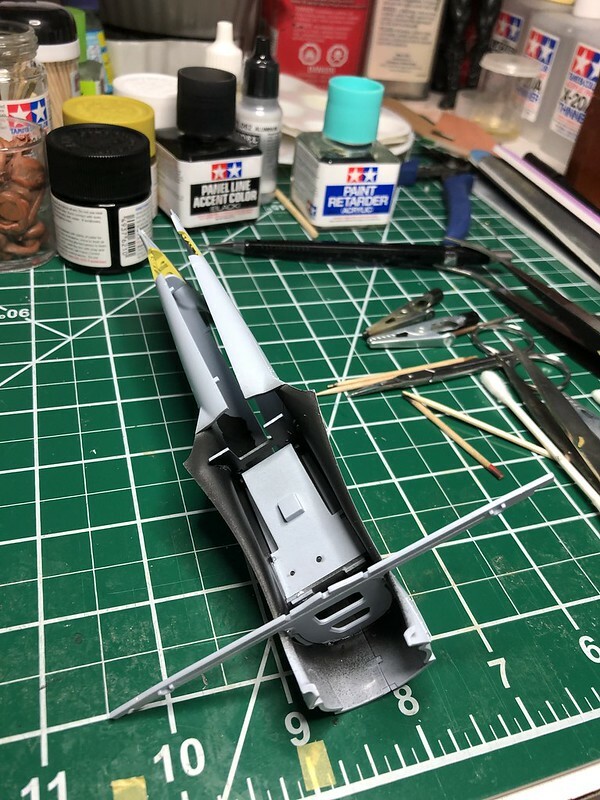 I have just started my HMS belfast for the British ships GB, which i will add here as wel. Its from the same period and has that brittle plasctic. Trying to be extra careful with it, but i am sure to break somthing soon. Defiant is coming on really well John. Mark, that just gets more impressive with every post. Great idea clamping that to the bench and i love those woden seats. Great idea about a newspaper. Thanks Bish. I've purchased some Milliput putty to use for making the newspaper. Never used it before, but have been meaning to try it sometime. This seems to be the perfect time. I have used Milliout quite a bit. 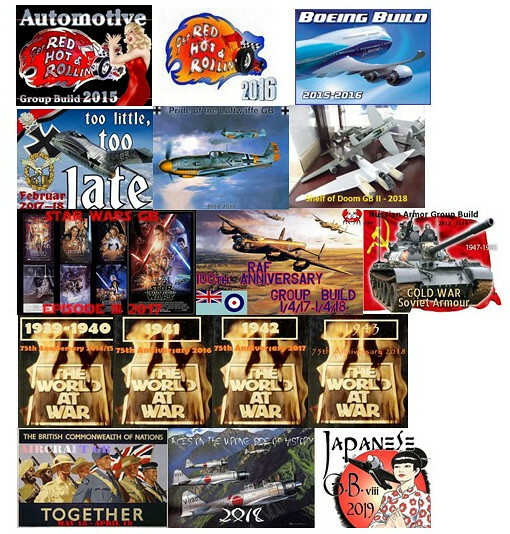 Mainly for Zimmerite but i have also made canvas covers with it. You have got the white stuff haven't you? Yes, it's the superfine white. I probably won't get around to playing with it until next week. Going to watch a few YouTube videos on using it. 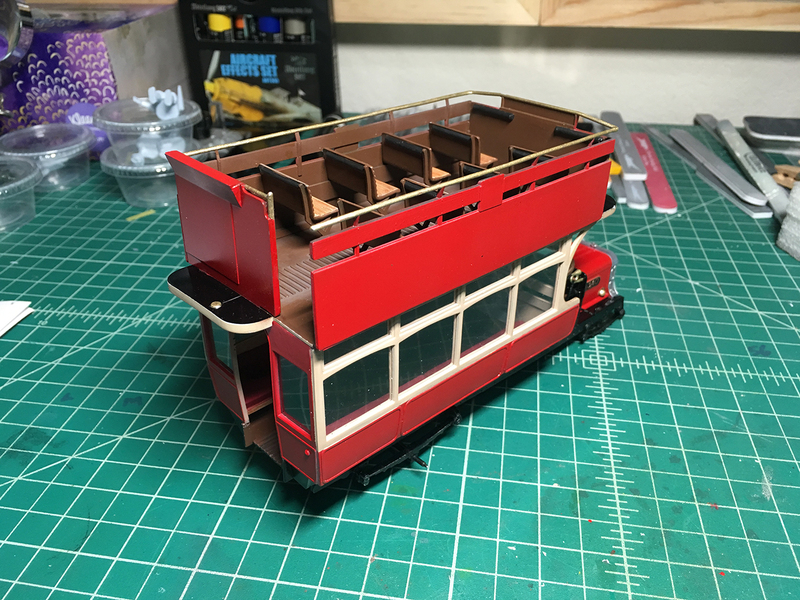 Preshading is done. 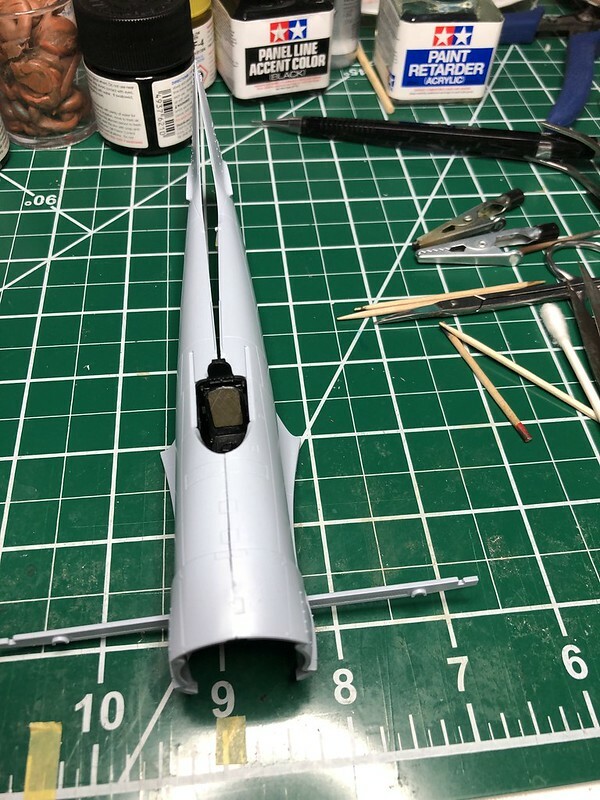 Time to lay down the base colors on the fuselage. The shade lines on the wings are still a little dark in my opinion so I’m going to add another layer of color. 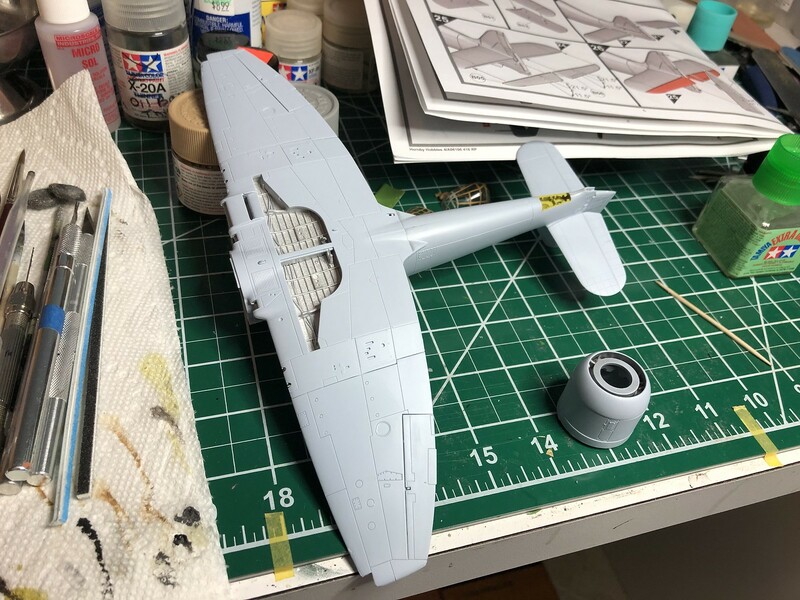 started on the seafury and many shades of black except for seat backing. 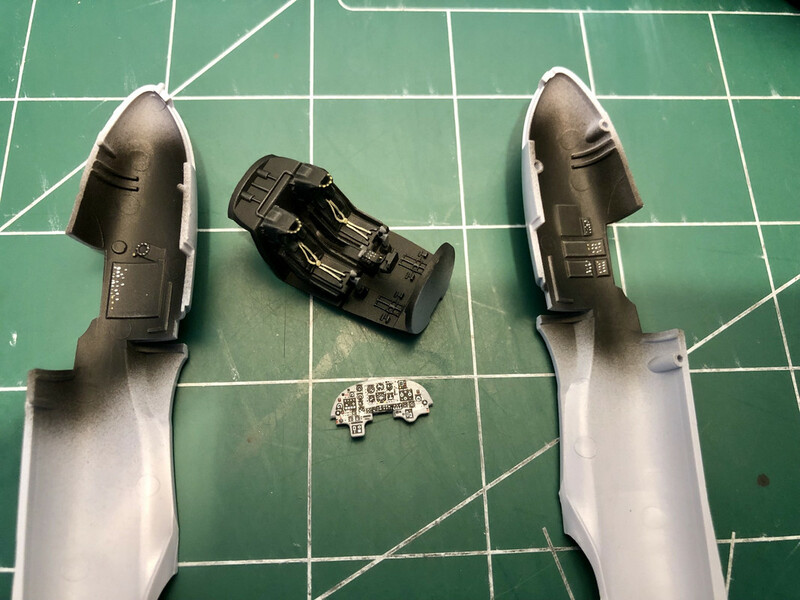 I used the decals from the kit pretty good I must say the decals that is. Thank you Nick! Did you cut those dials out and place them individually or is there one solid decal over the instrument panel? The center cluster of 5 one piece ,the right side two dials each the left are two single dials. Chad, looks like the Lightning is coming along nicely. 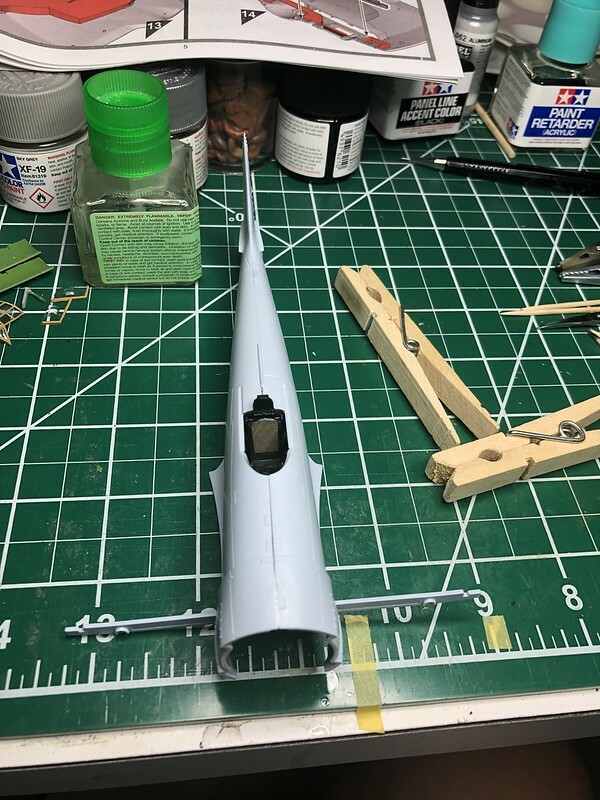 Is the long piece on the port wing a refueling probe? I'm not familiar with the Lightning, so I'm just guessing. Nick, the cockpit and instrument panel are looking great. And in the background of the first picture I see some really fine glasswork. Nice work. Chad, Nick, nice work guys, looking good. Bish, since the Lightning is winding down I’m going to go ahead and start construction on my second entry into this awesome GB. The theme for this build is going to be “easy”, since the Lightning fought me most of the way. 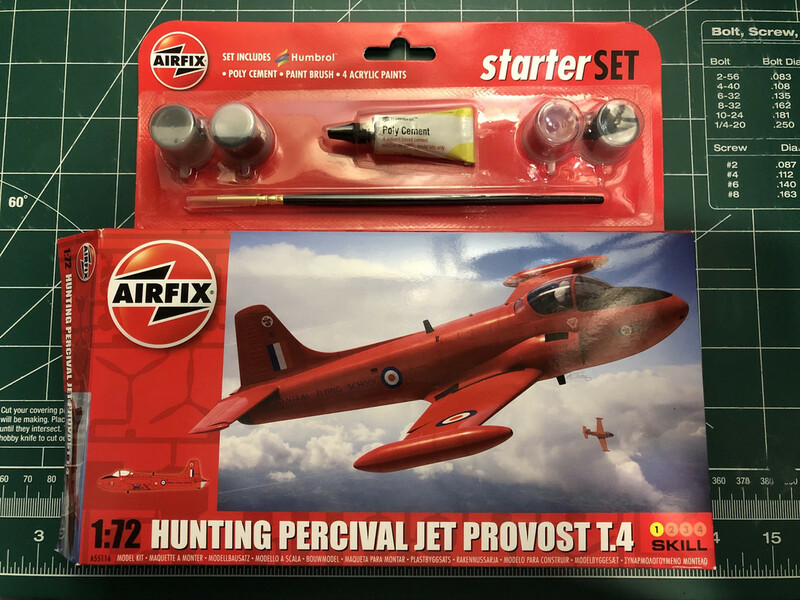 I would like to enter the 1/72 Hunting Percival Jet Provost T.4. Fingers crossed, this will be a quick and easy turn around. 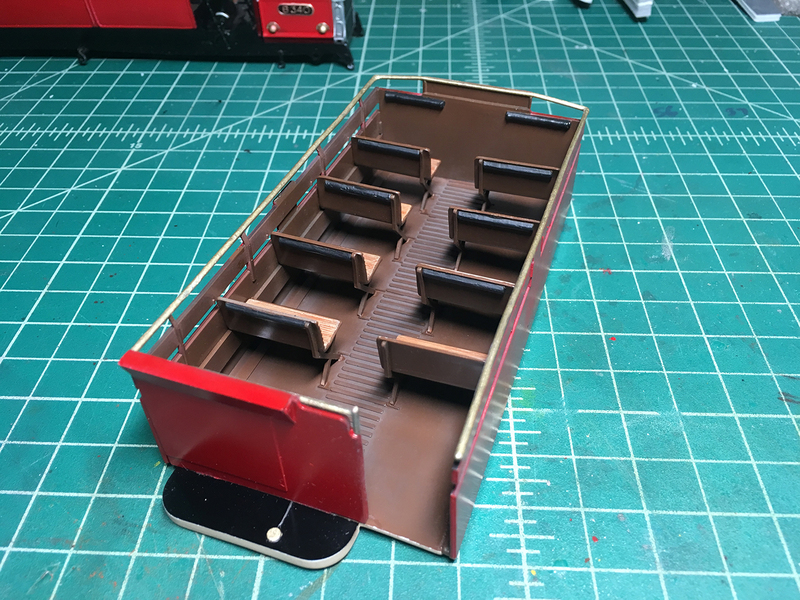 Finished up most of the interior detailing and weathering of the upper deck. 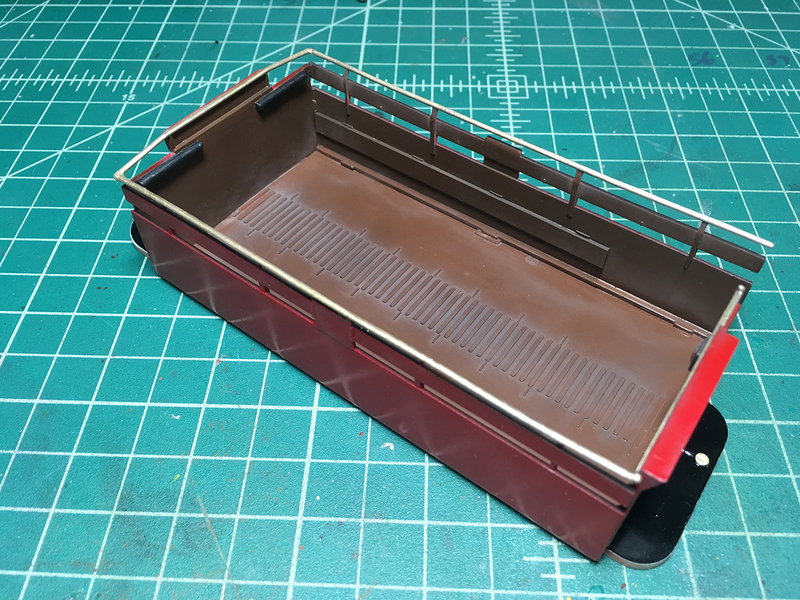 Used sprue-goo to join the ends of the hand rail at the front corners and left rear, then painted the railings with Tamiya X-31 Titan gold. 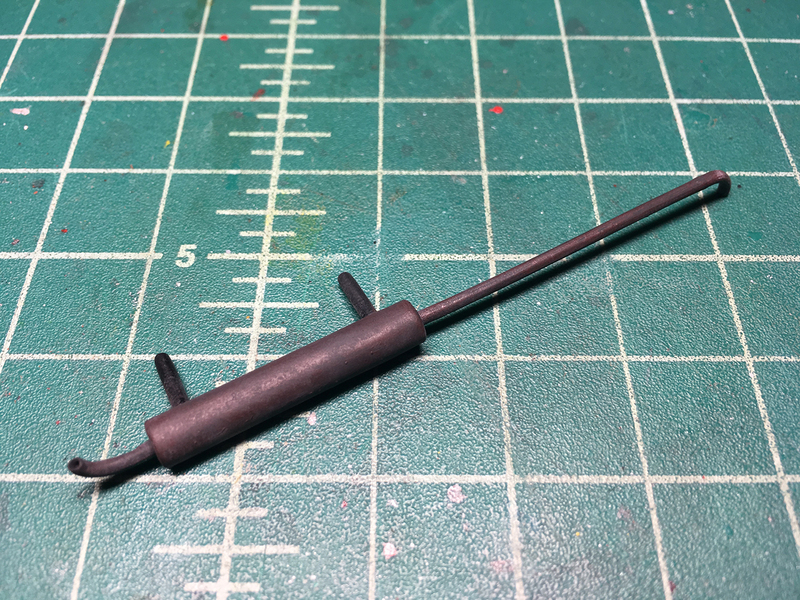 I like to use this for brass fittings. It's too gold straight out of the bottle, but after I brush some black pastel chalk all over it, it takes on a very nice aged brass look. 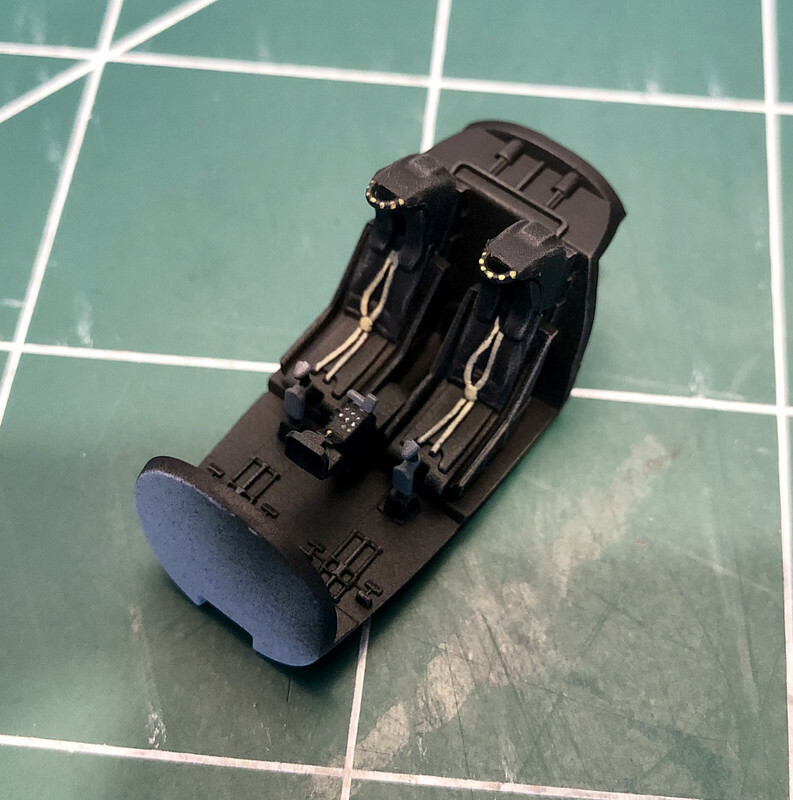 Painted all the "crash pads" on the backs of the benches (Tamiya XF-85 Rubber Black), then I glued them all in place. 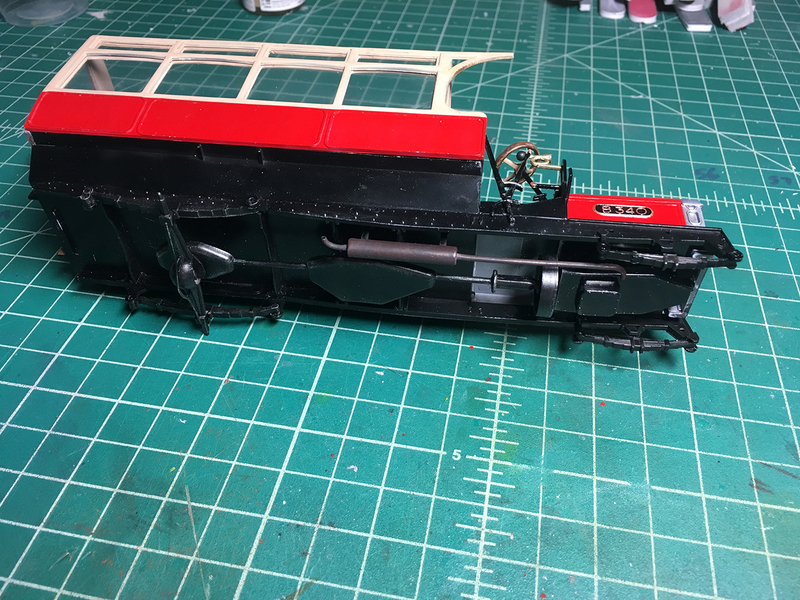 I'll still do one more weathering pass up here after the vehicle is assembled. 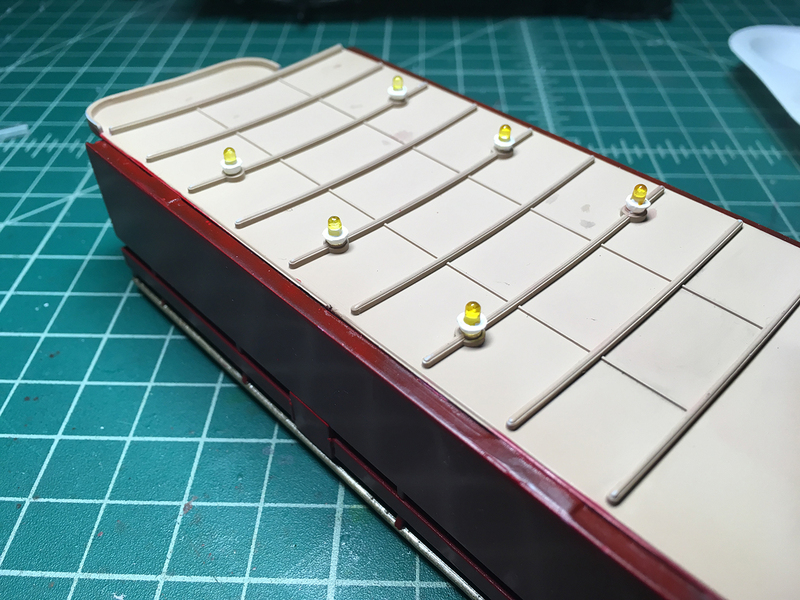 Next I turned my attention to the lights on the underside of the top deck. 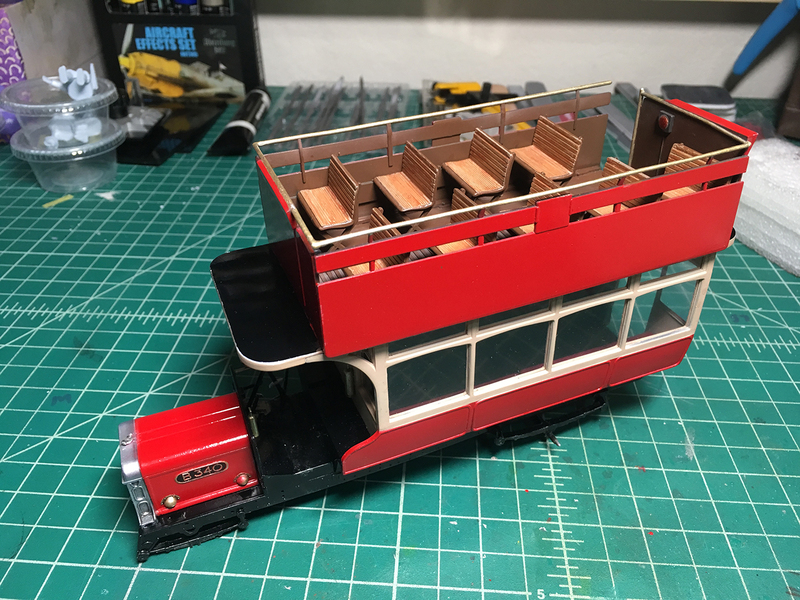 Here you can see the tiny lights on the bench next to the overturned top deck. First I had to touch up some of the paint, because some rogue drops of red paint landed on the ceiling. 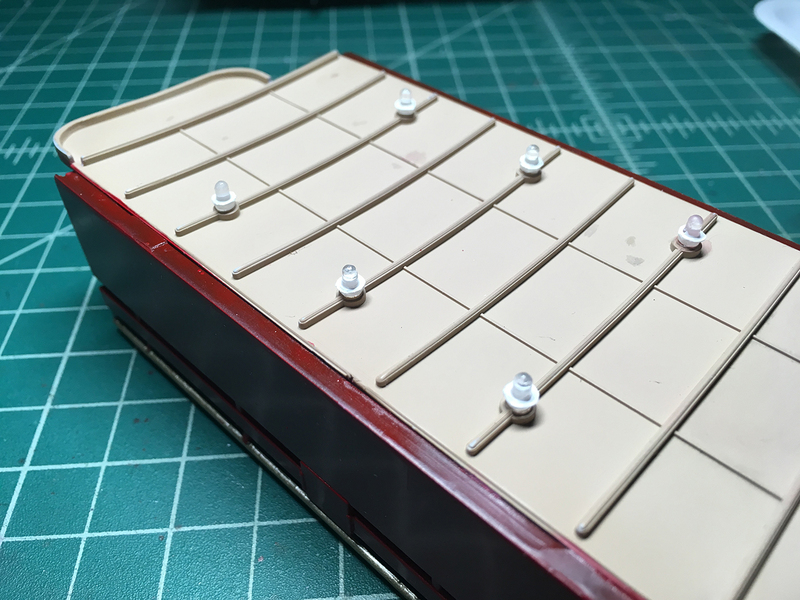 After glueing in the lights, I painted Tamiya X-2 Gloss White around the bases to give them that old-timey ceramic fitting look. Not sure if it's accurate, but I like it. 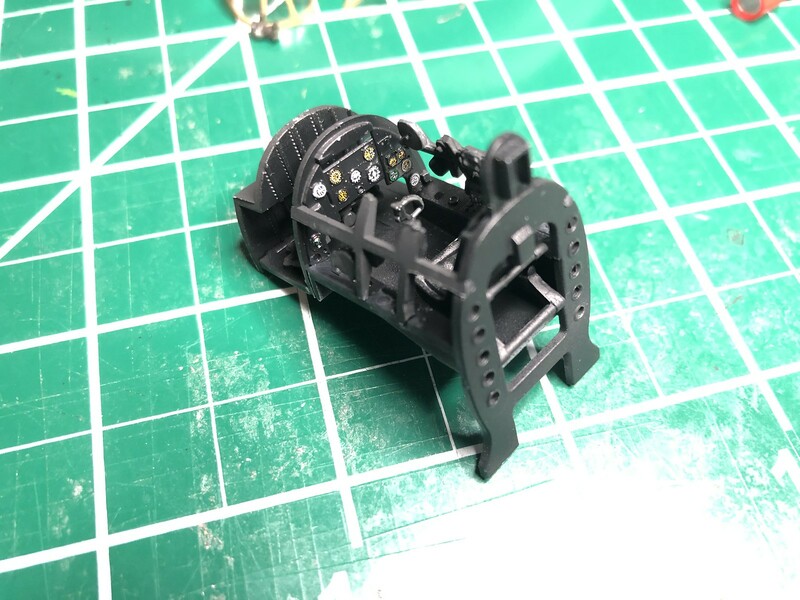 I was going to leave the lights clear, but decided to paint one of them with Tamiya X-24 Clear Yellow, just to see how it would look. I liked the look of it a lot, so I did the rest. Again, not sure it's accurate but I like it. And so we come to the close of chapter 3, of Tales of the Omnibus. 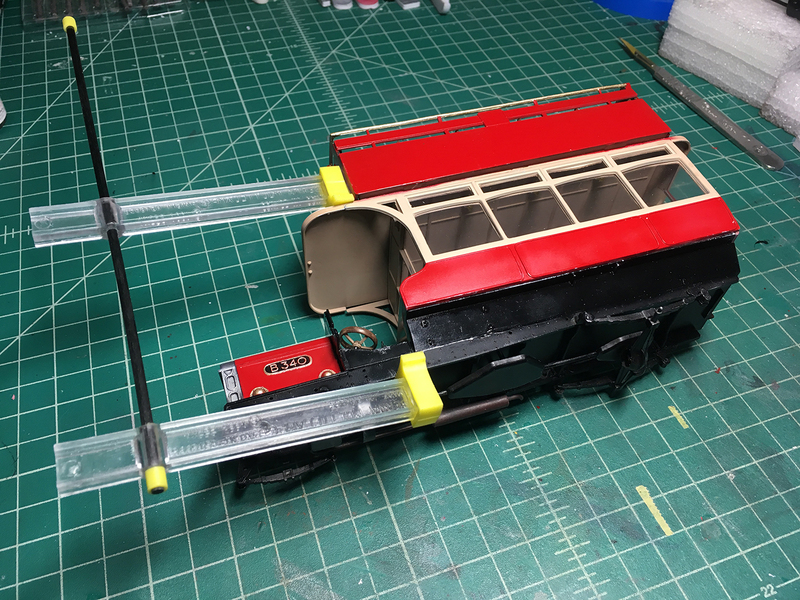 In chapter 4 we'll build up the drive-train and suspension, and finally attach the upper deck to the vehicle. 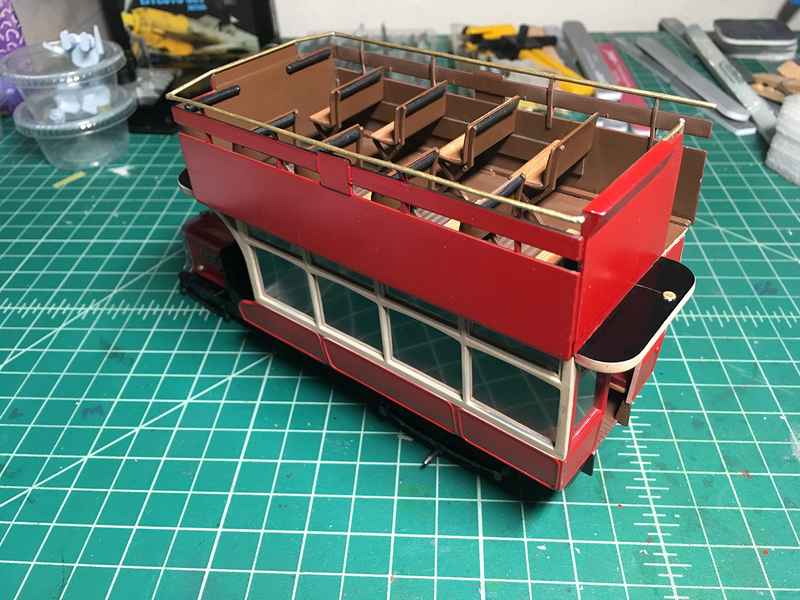 Managed to get quite a bit done yesterday, which is good because I have a pretty intensive freelance gig this week and won't have a lot (if any) bench time. We come now to the bits and pieces underneath the vehicle, the drivetrain and suspension. There's not a lot to do here, as the kit is pretty minimal in this area. 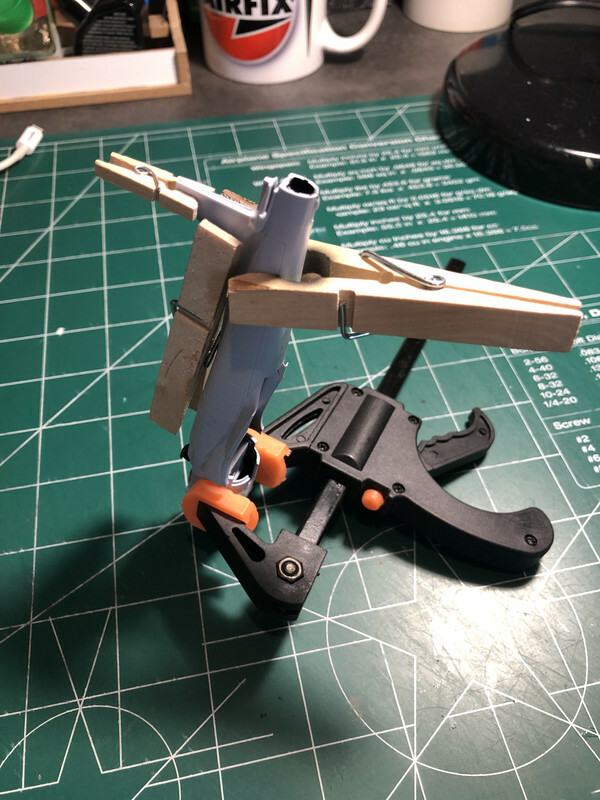 I glued up the drive train and prepared the other parts for paint. I was proud of myself for having the patience and steady hands to drill out the exhaust pipe. Then I realized the exhaust was the other end! D'oh! 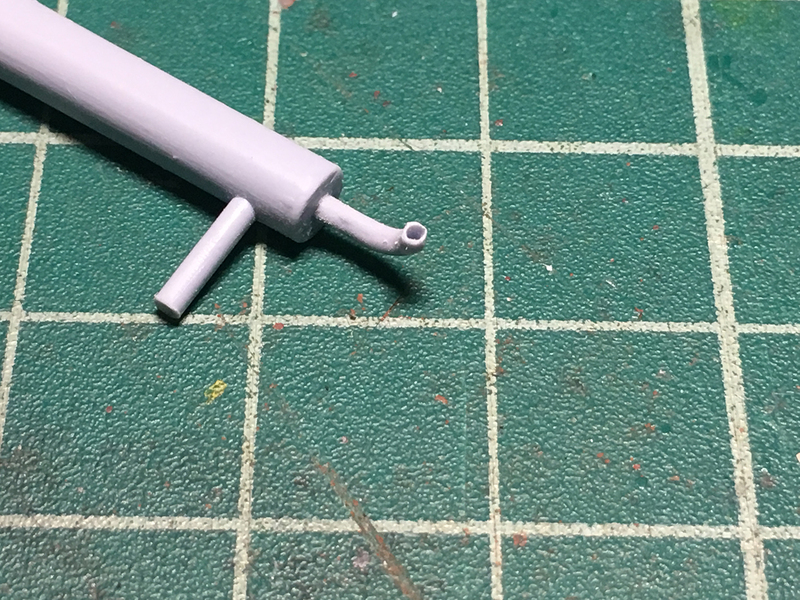 I sighed, and drilled out that end too. 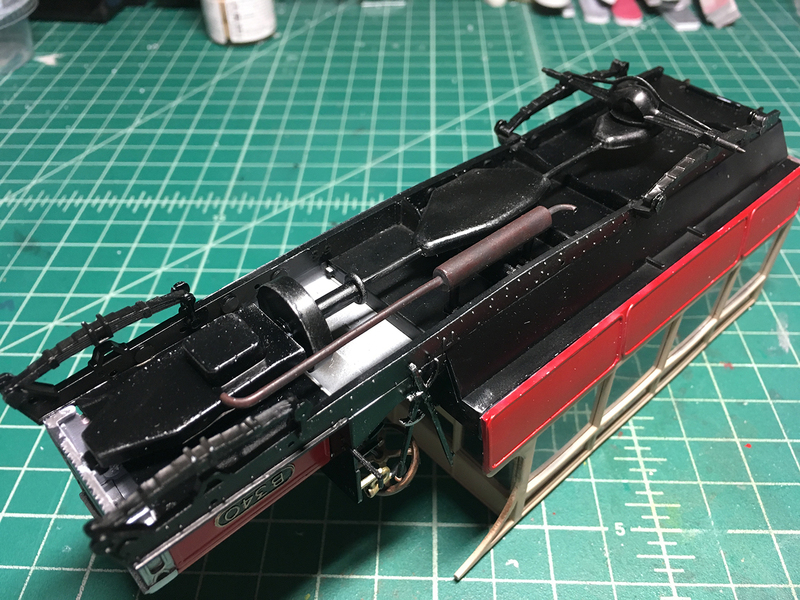 All the drivetrain, suspension leaf springs, and exhaust system painted and lightly weathered. I don't know why, but I really enjoy exhaust pipes. I like doing them on airplanes and enjoyed this one too. 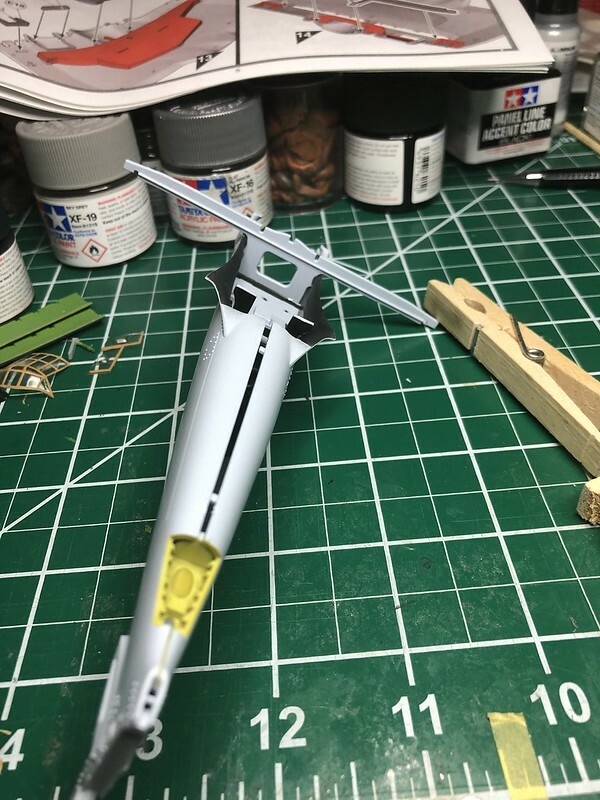 I always put down a base coat of Tamiya XF-85 Rubber Black, then dry brush over it with Tamiya XF-9 Hull Red. After that I use a short stiff brush to add black and gray pastel chalk dust. I like the result. The suspension leaf springs went on without any problem. Then the drive train and exhaust went on. 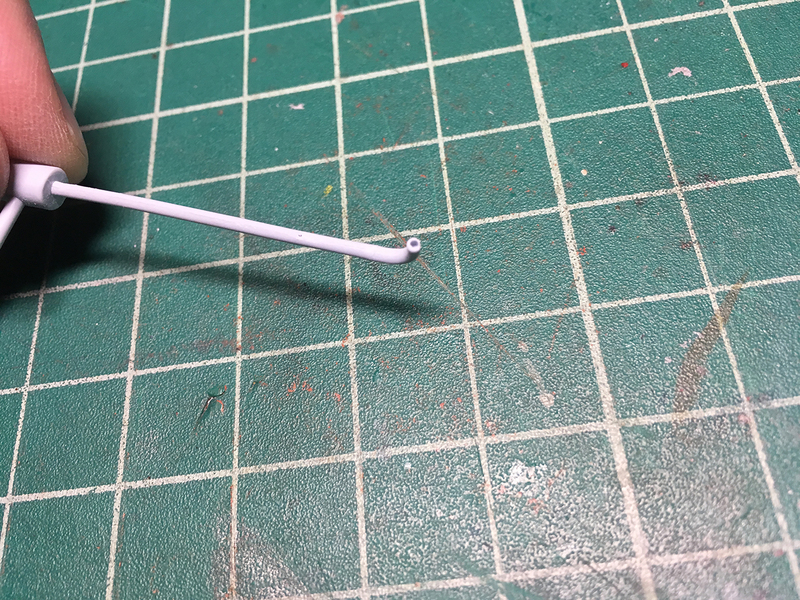 Sometimes, you need just the right tool to hold a piece down while glueing. 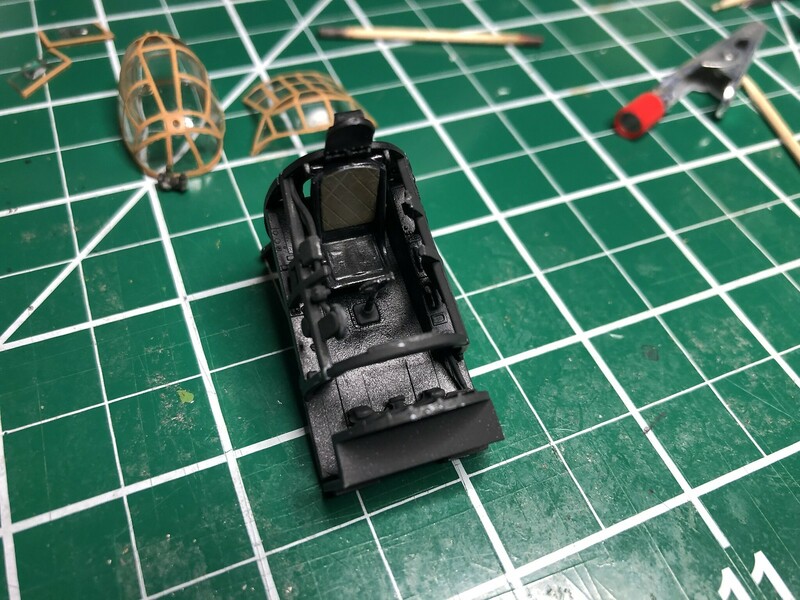 I know Airfix just wanted to give the viewer a taste of what's under the vehicle, but even I kknow that the exhaust manifold should not exit out of the oil pan. lol. 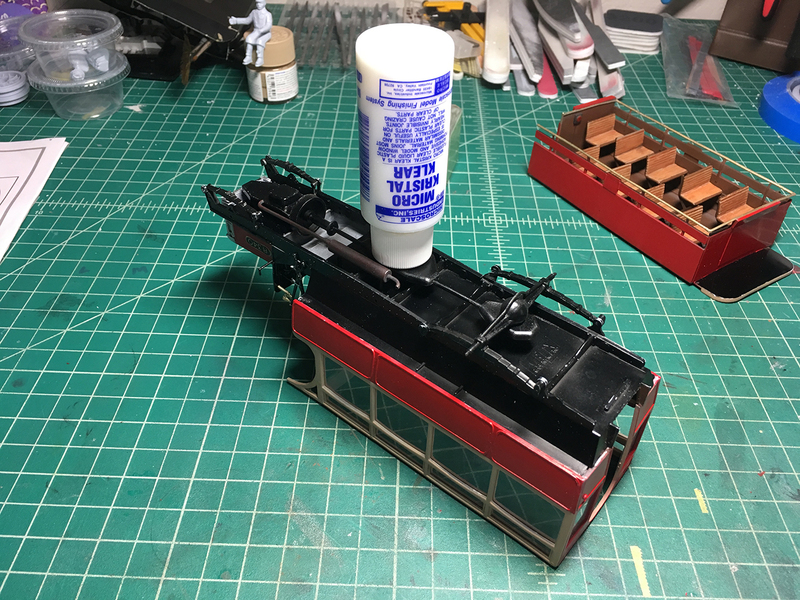 With the underside built up, and some light dry brushing for weathering, it was time to glue the upper deck to the main vehicle. YAY! It's really coming together now. The finish line is in sight... just. One problem now is, until the wheels go on the vehicle's a bit wobbly just resting on the springs and differential. It easily falls over if I bump the bench. So I need to get those wheels on soon! That will be coming, but before that it's time to tackle the platform and stairs at the rear. That will happen in chapter 5, of Tales of the Omnibus. Mark - Seriously great job on the Omnibus. 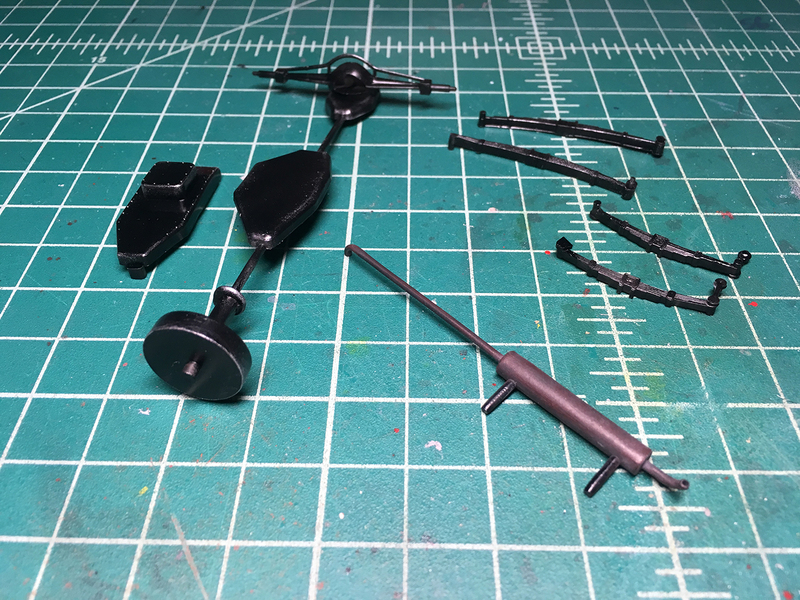 Started working on the Provost. Taped it together to check the fit and looks like this one should be a slamdunk. 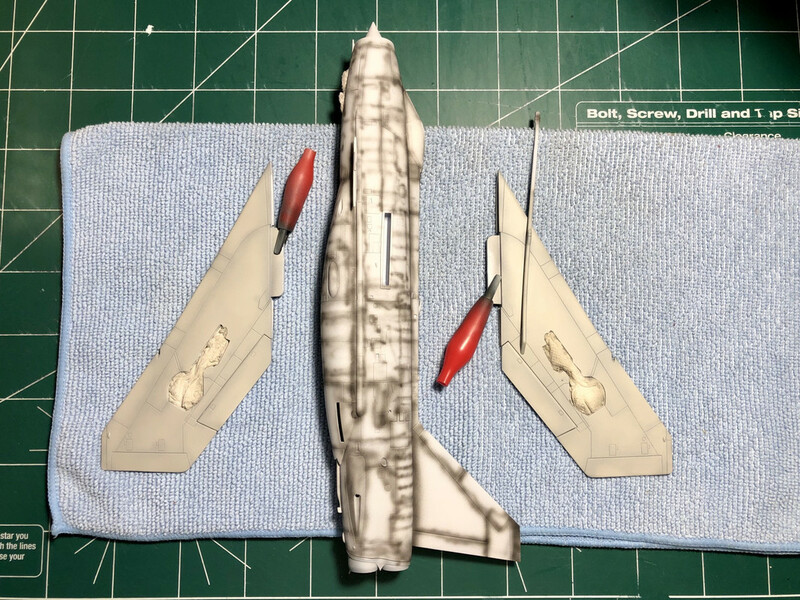 Interesting size comparison with the Lightning. This was definitely a tiny trainer! Look forward to seeing that Chad, will get you on the roster. That really is coming together Mark, looking awsome. Can't wait to see this complete. 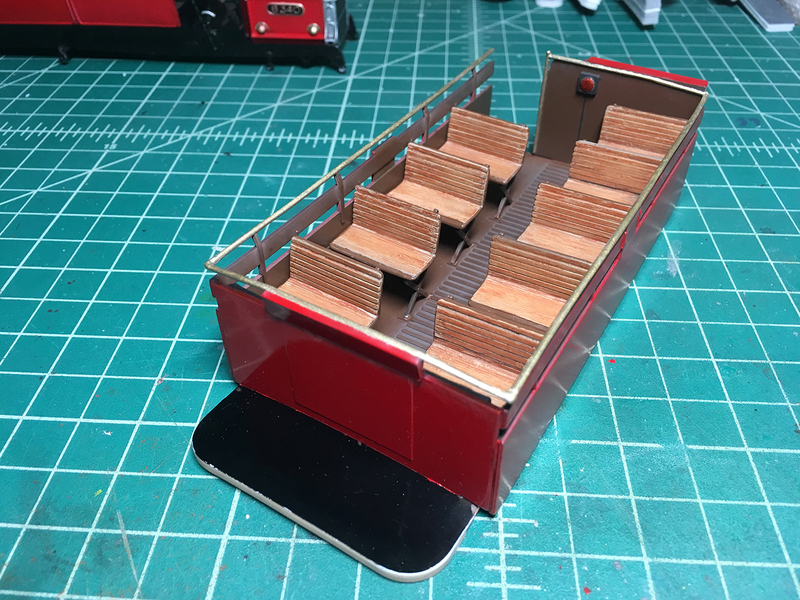 Mark the bus is moving along nicely . I like the wood grain on those benches and the yellow lights nice touch and on the undercariage. Chad at least the trainer as a better fit then my sea fury. Oh no. I’ve got one of those that I’m looking forward to building. What is the cause of the poor fit? Chad I tackel the bow one section at a time. The real problem is the cowling.I managed to get though it but I used 00 steel wool to even out the cowling ring. Here are my lastest pics. The plastic is very soft and can be a double edged sword but we will see whats next. 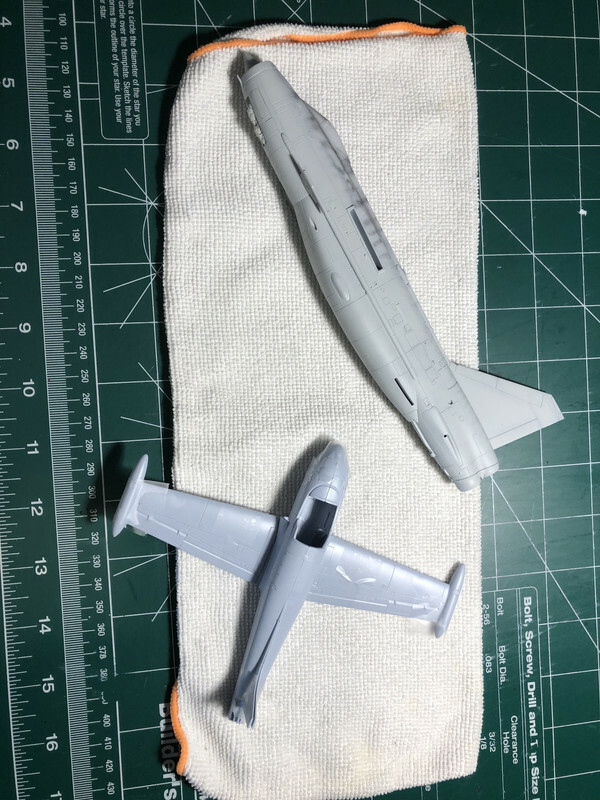 its looking like a sea fury... some putty here and there check for seams, I am really debating if I should prime with gloss black or flat for alclads high speed silver? its seems to me that this color is a glossy aluminum will test 1st. Nick, that didn't look good, like the Airfix of old. That was worse than the fit on my SM 79. You got to grips with it well though, would never know looking at it. I agree. Really looking excellent considering that huge warp it had. You sure smoothed out those gaps Nick! 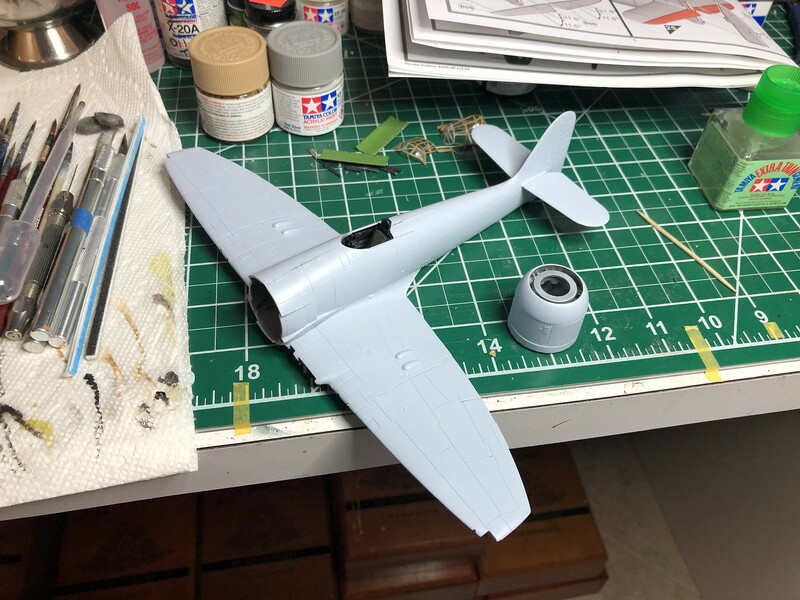 A little more progress on the Provost. 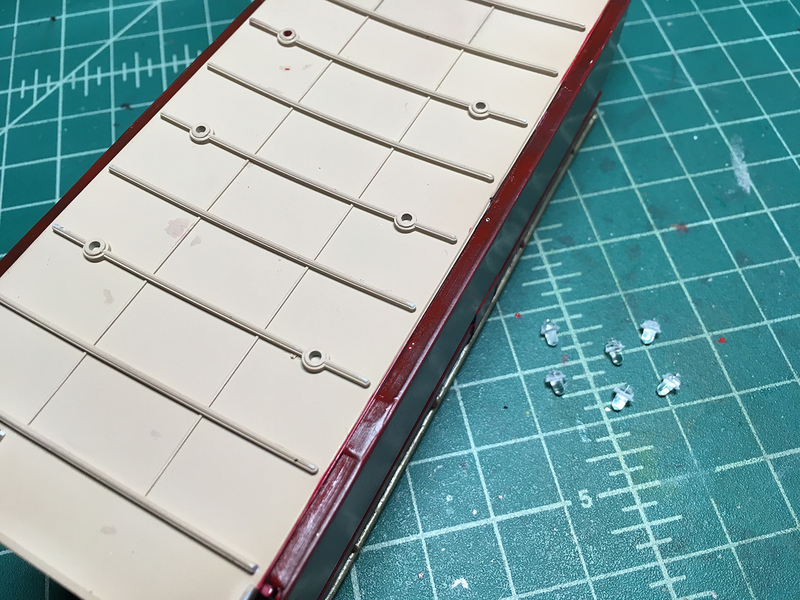 Finished the interior and hand painted some very intricate and complicated dials and switches on the fuselage sidewalls lol! 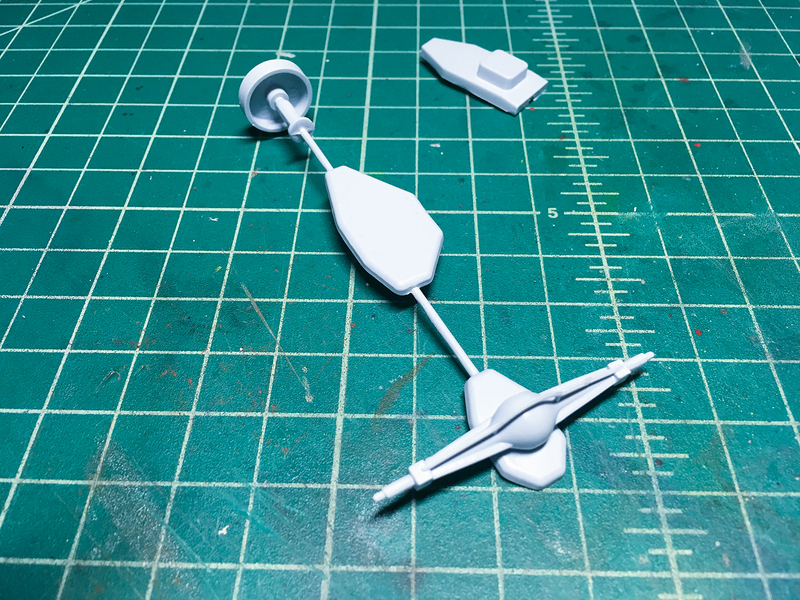 I will provide a video tutorial at a later date. Looking great Chad. 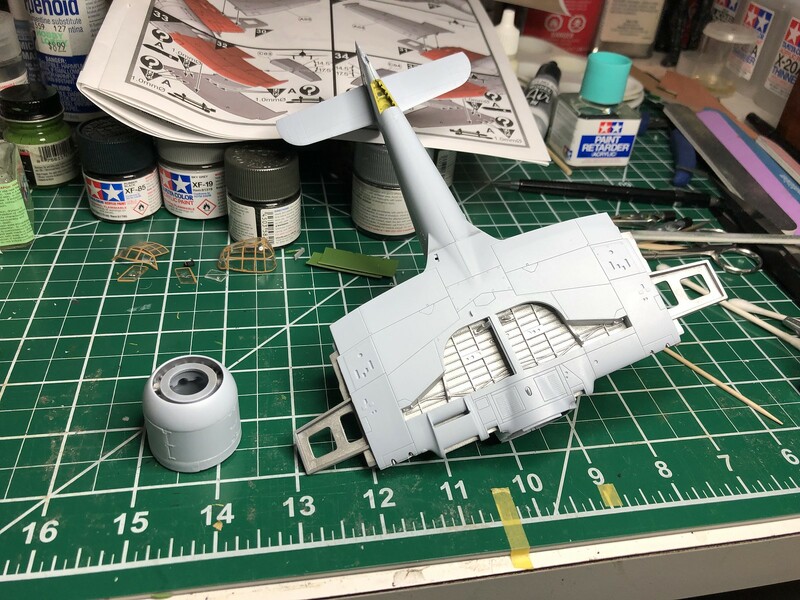 Nice work on the detail painting, look forward to see your video.